THE alleged killer of Irish charity worker John Curran was today remanded in custody to be held inside one of the world’s most feared prisons. Congolese born Mitspa Onyoka, 24, tried desperately through his court interpreter to be granted bail to avoid the notorious South African jail. But his application at Cape Town Magistrates Court was turned down after prosecutor Leon Snyman revealed Onyoka was an illegal immigrant. The court was told that the cleaner was also facing “extremely serious” charges of murder and aggravated robbery following the death of Mr Curran, 60. And with no fixed address the prosecutor strongly opposed bail for Onyoka for fear he could abscond. 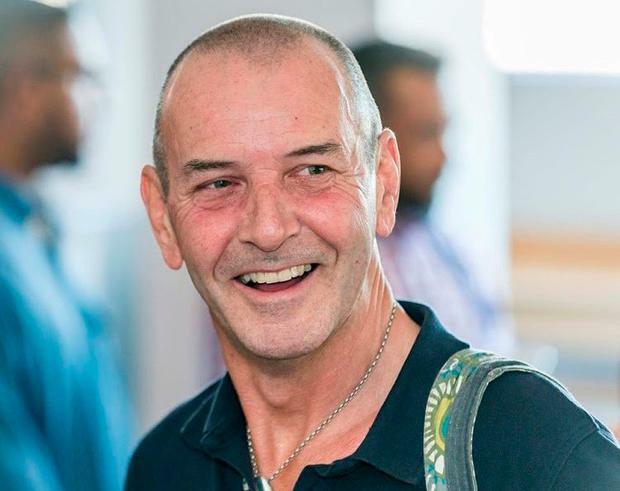 The popular Dublin born father-of-four was found with multiple stab wounds to the head, face and body in a large pool of blood at his Cape Town flat. Onyoka was arrested after a swoop at his place of work on November 23 after CCTV photographs were released by murder squad detectives. Prosecutor Mr Snyman said: “The prosecuting officer has indicated that the accused is not welcome at the address he was living at when arrested. “There are no outstanding warrants on him and no previous arrests but Home Affairs have no records of him being in this country after 2015. “We are opposed to the release of the accused” he said. The court advised Onyoka that he had little chance of being granted bail but he insisted on being allowed to make an application to the court. Magistrate Joe Magele granted the alleged killer permission and remanded him in custody until the application can be heard before him on January 23. He was led down to the cells awaiting transportation to Pollsmoor Prison shaking his head. Onyoka last appeared before the court in underpants and a t shirt but today wore a pair of grey slacks, a green t-shirt, windcheater and flip flops. Originally built for 4,336 men it holds over 7,500 prisoners and cells built for 30 people often have up to 80 prisoners sleeping in bunks and on floors. Violence inside is a way of life with murders and gang rapes a common occurrence and with inmates at risk of TB, HIV and Weils Disease. UK TV actor Ross Kemp did a documentary inside Pollsmoor and said after going inside: "It is a human zoo. I am frightened. Not even the warders in here are safe". Mr Curran had spent two years working in Cape Town as the Director of Education for the the much respected Irish NGO Mellon Educate based there. His task was to oversee the building of thousands of homes for the poor and the refurbishment and building of schools to educate children. Mr Curran’s contract ended in September and he had taken two months off to enjoy a “farewell holiday” to South Africa before heading home. The former teacher had moved into a flat in a secure apartment complex in Cape Town which he had been renting until he flew back to Dublin. But on November 7 he was found dead after a female friend let herself into his flat and found his mutilated body lying on the floor behind the door. A memorial service for Mr Curran was held in Dublin last month.